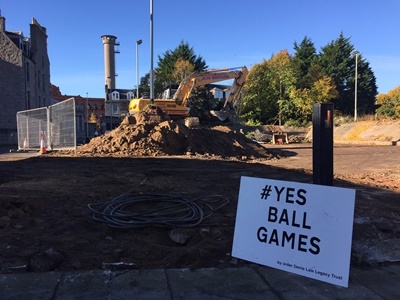 Work has started to create a world-renowned multi-use community sports facility in Aberdeen. Over the next two and half months a run-down under-used community space in Aberdeen will become a hi-tech, all-weather play and activity area for people in the surrounding areas and the wider Aberdeen community. Catherine Street Court is set to become Scotland’s first Cruyff Court – the brainchild of Dutch footballing legend Johan Cruyff – as part of city centre regeneration plans. Aberdeen City Council, in partnership with the Denis Law Legacy Trust and the Cruyff Foundation, have come together to bring the initiative to the Granite City and encourage fitness and well-being in an urban environment. More than £250,000 has been committed for the project which will include planned sports activity for children and young people. Aberdeen City Council Leader Councillor Jenny Laing said: “This ambitious project is another example of how investment in existing facilities can transform our communities for the better. “The Cruyff Court Denis Law is part of a global initiative which recognizes the educational, social and inclusive value playing fields traditionally brought to our communities. “With work on this new facility starting on site there is a clear sense of excitement and enthusiasm from children and their families in the area. There are more than 200 Cruyff Courts in more than 19 countries around the world which have provided safe play areas for thousands of children and young people. Numerous sports stars & athletes have credited their success with having access to Cruyff Foundation facilities growing up. The Cruyff Court Denis Law, which has been designed with input from Communication Design staff and students at Gray’s School of Art, will enable access to a wide range of free activity sessions, including freestyle football, street hockey and street dance and will be managed by Robert Gordon University’s Streetsport programme in partnership with a range of other stakeholders and activity providers. Hunter Construction Ltd has been contracted to carry out the work and is a local company which specialises in artificial grass sports pitches. Graham Thom, Chairman of the Denis Law Legacy Trust, underlined how important the new facility can become for young people throughout the city and said: “We are delighted to be delivering Scotland’s first Cruyff Court which will form part of a lasting legacy for Denis who has been a fantastic ambassador for the city over the years. “Denis grew up near by and achieved many great accolades as a player winning Scotland’s only FIFA Ballon d’Or. He is role model for many people and he is delighted that the court will be named in his honour”. “At most, it’s a couple of bus journeys away from anyone in Aberdeen which means that youngsters eager to use the court and be part of something meaningful, can access it easily. We are encouraging everyone to keep fit and healthy and to join in with something that will improve their lives in various ways. “Aberdeen ought to be proud to be the first city in Scotland to establish a Cruyff Court and being bang in the city centre will afford the level of access and profile it deserves”. “Streetsport and various other deliver partners will provide a range of opportunities for many disadvantaged young people from various parts of Aberdeen and beyond and we will strive to remove barriers to participation as all of our activities will be free of charge”. Niels Meijer, director of the Johan Cruyff Foundation, said: “We are delighted that we could offer the community of Aberdeen a playfield that stimulates physical activity. “But it is designed to be so much more than just a football pitch. It is a place where pupils learn about respect, responsibility and integration through sports.